These talented artists address, in both thematically and stylistically distinct ways, the manner in which images evoke memory. This is achieved through the use of text, the presence of previously filmed « found » footage, a scenic train ride bleeding into digital pixels, single frame printing devices, evocations of 9/11, a tribute to a deceased filmmaker, peripheral vision, recall of sleep via animation, seascape imagery folding back on itself in time, and bittersweet remembrances of now-extinct Kodachrome film stock. Entering its 10th season this year, the Tribeca Film Festival has become a signature New York experience with a built-in global reach. With the support of founding sponsor American Express, the Festival has developed into a unique platform for showcasing some of the best new voices, ideas and narratives in cinema today. The Festival’s range, depth and diversity reflect not only the fabric of New York but also the larger world community beyond. 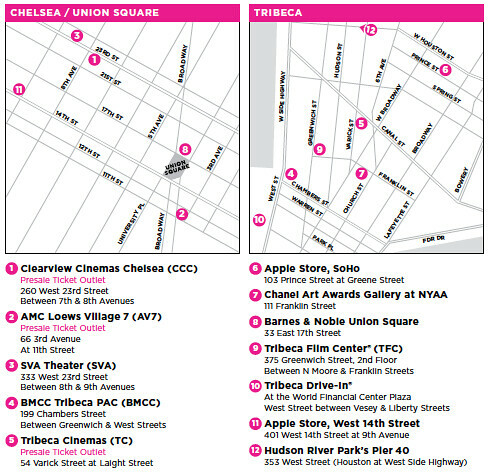 Tribeca has continuously redefined the traditional film festival experience while maintaining an integral relationship with its namesake neighborhood. Started by cultural pathfinders Robert De Niro, Jane Rosenthal and Craig Hatkoff in 2001, the Festival was initially organized to promote the revitalization of lower Manhattan through the lens of the arts.